Download the latest version (1.7a) of your Tavamithram App. It also contains the entire Bhagavad Gita. 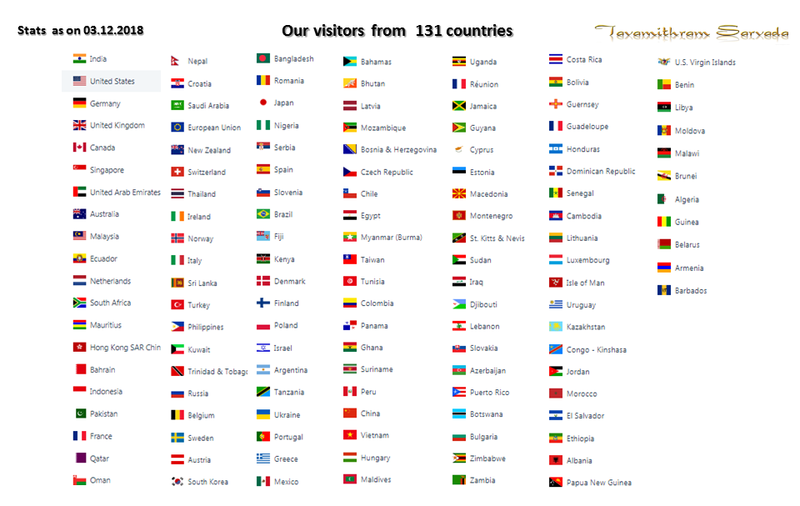 My sincere thanks to the visitors from 117 countries around the world. This site has been a place that gives hope to people undergoing challenging situations in life. Learning about Divine Truths and the simple laws of Nature and of Karma, quells unnecessary negative thoughts from the minds of people and it empowers them with tremendous amounts of their own Inner Power. The Divine Words of Bhagavan Shri Krishna by teaching the Srimad Bhagavad Gita through our sites, posts and videos. By the Divine Grace of Bhagavan Shri Krishna, this site has connected my soul with those of thousands of wonderful people from all over the world. It is heartening to hear from them that their lives have changed for the better and that they feel happy and content with themselves. Listening to our visitors describing their growing devotion, love and adoration for Bhagavan Shri Krishna is overwhelming. It is gladdening and satisfying to hear from visitors that this site brings optimism and positive energy into their lives. Thank you Sir for sharing your mindful insights with all of us. You’re indeed our friend forever, who is always there whenever we need you. If anyone has landed on this page while searching for solutions in your knotty life, i would say you are at the right place. Please keep following the posts and you can truly get there where you want to see yourself in life. His impeccable intentions to refine our world is inspiring and thought provoking. I am grateful to you. May god keep his blessing on you forever doing this immaculate job. Am waiting for some new posts from you. The Aditya hridayama is excellent. I never heard like this before. It is echoeing in my mind throughout the day. I learnt 10 verses in only one day and I am very greatful to you. Thank you very much sir for this video. I very much like it. Sir! You are a great! My thinking completely changed now. Thank you so much for your time and patience to listen me.Thanks for giving me a boost of hope,I really start feeling better.Its commendable and highly appreciated that you are responding and helping people selflessly.after talking with you i really felt that i found my Mental support and your words still in my mind,you’re advised and neat concepts really helped to give me that kick in my mind. i am really proud to be a part of you sir and learned from you to help people selflessly. Fantastic interview of Steve Jobs! Yes everyone and anyone can make a difference if we decided to do so. Thank you for sharing this video Sir! I thank each and everyone who has thought of me on my birthday and has sent me mails and messages on the blog. It gave me immense joy to read thorugh the messages. I pray that the Grace of Bhagavan Shri Krishna be upon each and everyone. Krishna is all pervading. Krishna is the personification of the entire system. Some people have written to me expressing their fears about tougher times during Sade sati. Well, I would say that reading and trying to understand the Bhagavad Gita helps straightaway. The very feeling of being one with the entire system makes a person powerful and absolutely fearless. Faith indeed is extremely mighty. Happy Birthday!! Our friends together with Krishnan and me had a great time yesterday and we all thought of you. We wish you all the best Sir for all your projects and ventures. Humble regards and namaskarams to you. My Birthday wishes to you – though a day belated. Thank you for your wonderful mail Sir. I will preserve your mail with your golden advice all my life. Thankyou . Keep inspiring people. Your highly positive message is greatly appreciated! The way you now think is truly wonderful. Recently one of the followers exchanged messages with me. She spoke about the problems that she was facing. The simple thing that I asked her to do was to look at her problems and worries with scorn and to drive them away. Thinking about worries or other negative matters cause waste of time. I assured her that by doing so, the problems which were menacing her, would simply fade away into nothing. I am glad to see that you are following this rule well and it is helping you in developing fearlessness and absolute faith. My rashi is vrishchik and I had a terrible time, professionally throughout 2014. Soonafter I had joined in 2010 I had said no to some unethical task my boss had asked me to do just after I had joined andI hurt his ego. Eventually he got promoted and trouble started just about in 2014…also my troubled times during sade sati. Somehow or the other I would be trapped…politics, performance or otherwise. I would cry before going to office and after coming frm office…every single day.I knew my days were numbered and started looking for jobs. Over the years I had alao grown unhappy because I knew that a similar job would mean similar circumstances…I wanted something better and didnt know what. By this time I had come across this bloga and Tavamithram had helped me out by his advice but by September 2014 things became umbearable and once again I sought help from him…he said 2 things that really helped me..
A. Avoid negative people during sade sati. They do no good but only break your resolve. B. Why do we build our Gods we 10 hands? It is because you never know which hand is at work for you and will open a door for you. Have faith. You will find your way. The very next day I went and put down my papers. I told myself that if God is so powerful then why let any fear surpass Him? I am educated, if required I will learn again but no longer will I allow someone to play with my peace of mind. I had figured out in sometime that I prefer speaking and learning and took up some coyrses in corp training. Next 6 months wrte tough only moneywise. I gained a soul…i learnt about my purpose in life and how to appreciate small things and loved ones, relax and surrender. And whatever I had wanted has come my way. I have joined a startup in training as a trainer and core member. Am doing all that an MBA learns in a classroom and dreams to apply and learning and growing. My tough days arent ovr yet…but I dont care anymore because I feel now I enjoy what I do…I am aligned to my purpose that the Source had assigned me. Tavamithram your words unlocked the courage in me. I cannot thankyou more. Will be grateful….sarvada. For all my friends here…do not be scared of tough times. If you take them with pstience and positivity you will find happiness. Wonderful site. Thank you! This has definately changed the way I look at things. Thank you very much for the great advice you gave me today. I am very thankful to Rohit for introducing me to you. I was suffering for so long and after talking to you i realize and understand now how to think. Guruji I will follow all your advice strictly and all the steps too. So nice I feel after talking to you. Please accept my humble pranams. Yes Dhanu Rashi is under Sadé Sati now. Never mind about your friend’s beliefs. All that matters is that as you say, she is a good hearted person. I will be posting some new articles very soon. One of my friends is in deep trouble because of an unexpected turn in her life in the middle of November. I checked her chart on the net and she is Dhanu rashi. Has she been affected by sadesati? She is a very good hearted person and a very good friend of mine. She was the one who stood by me when I was let down by everyone else. I feel very upset to see her upset. She is Canadian and she doesn’t believe in things like astrology or Indian traditions. I have forwarded her some of your posts. Guruji please post some new articles as I am also waiting to read some new and motivating stuff from you. Thank you very much and kind regards to you. We are eagerly waiitng for the kids blog. Please also let us know more about the blog. In fact I know a South Indian family living in the US. They have two children 5 and 7 years of age and they requested me yesterday to suggest to them any books or CDs they could buy for their children to teach them Indian epics and other stories. I told them about you and also how you completely changed my life. My sad story is no longer sad but for me it was a tough lesson which I learnt like a good student. My sincere thanks and namaskarams to you Sir. We wish you and all visitors a very Joyous Diwali! Let us all pray for peace and prosperity for everyone. So many people who visit this blog have written about their troubles and I wish them all God’s blessings. Sir, my father asks me convey to you his best wishes and says that his prayers will always be with you. It is a pleasure full of delight and enlightenment to read your blog. The perspective you have presented is by far more logical, scientific and sensible as compared to the traditional resources currently available. The stories you share are very inspiring. Having met with you and conversed with you so many times, I feel privileged to have you in my life. Because I truly believe that you are a genius, an exceptional being with a bigger purpose, who’s keeping a low profile for now. I am blessed to have you as my guru. Thank you for being there, and to touch so many hearts, so many souls. Thank you very much for giving me some of your valuable time. For me you are like an oasis I found in the middle of a terrible desert called life which I was walking through all alone. Usually I only surf the net but I never post any comments anywhere. But with you I thought I must tell you and also let other people know what a major change you brought in my life within a 37 minutes conversation I had with you. When my husband left me after ill treating me during the first two months after our marriage, I thought my world had come to an end. Everybody spoke bad things about me and blamed me for that man leaving me. I am the one who went through the torture and how can others know about it? They said I am in sade sati that is why this happened. Sir what can I do if I am in sade sati? Is it my fault? Some elderly people can be very bad to young women. Whatever happens in the marriage, they hold the girl responsible. On Friday I am starting the Baglamukhi puja you told me and I believe you fully that this will cleanse my mind and body of that that marriage and I will start afresh again. You have given me great confidence Sir. The strangest thing is that while speaking with you I did not feel I was talking to you for the first time. You are a very kind hearted gentleman Sir. I sincerely pray to God to always protect and bless you and your family. Thank you very much and I will always be grateful to you Sir. I keep talking to many people around and understand when it is spirituality or devotion, people have a wrong perception of leaving the existing life and their passion and their own self and try to move on with completely different direction to achieve something which they don’t know what exactly it is. This conflict of mind and attitude really makes me surprised. Human being has the power to understand everything but we do not understand and we take it in only one direction. Either that, or this and we never think why not both!! We do not need to reject anything, we do not need to eliminate anything because, if we do not understand or be aware of darkness, we do not even realize the importance of light. So I feel we should be ourselves and move on to acquire lots of goodness (in whatever the form it is available) from this universe. Do not scarifies, do not compromise but do your duties at the fullest and God will smile to you with lots of blessings. We are born to live and not to die and we are to be with emotions making them as slaves and not to keep dead emotions inside us. Love you Master and the way you draw line between the materialistic life and spiritual (divine) life and the way you balance both together with your own way is beautiful. When I saw your pic these thoughts rushed into my mind and thought I should just share it here….. I hear your Shiv Tandav and Sirji, you must do a CD with all your Mantras and I will be the first person to buy 🙂 You have a fantastic voice and you sound very powerful when you speak or say Mantras. Actually I followed your instructions and stood with my hands folded and eyes closed and when the song was over and I opened my eyes I had tears in my eyes. I was feeling so strong and happy. Again Sirji thank you very very much. On Saturday I will play it to my parents. I would like to tell you that all of us in our family are following your advice and have adopted our new way of life. After reading how you have explained the idea of personification of God refering to 7th chapter in Gita I am convinced it makes sense. Please write more in detail about what you explained to me why all religions glorify God and sing praises. What you said was fantastic and it seemed more believable to me than anything else. Your approach of explaining things in a scientific way is also impressing my young sons. Even they are trying to find reasons and meanings behind many of our traditions and customs! Please let us know when you come to Bangalore next time. Welcome to this blog. Thank you for your kind words and I am glad you liked my article. It is quite common among humans to forget the sacrifices that great people have done for us in the past. A single act of self sacrifice by one single human being in the past changed the whole course of history and I believe that we need to remember such a wonderful Hero and and offer our homage to him. Googling for a good article for my daughter, led me to your splendidly written work on Shri Guru Tegh Bahadur JI. Please accept my sincere thanks for this. I have shared your article on my facebook page as I felt such a good article should be read by as many as possible. Belated Birthday wishes Sir !!! Have a wonderful year ahead , may you be bestowed by god’s grace . My prayers and best wishes to you and your family . we wish you a very happy birthday! I have speaking with you quite often but I weould like to inform others who visit the site about the great help that you have done for us. We are now well settled in LA. My daughter whose entire future you saved from destruction is now doing very well and she is making us her parents and also our country India proud. She is outstanding in her studies and she has become very popular in her college. Your patience, sincere desire to help others and lead them away from pitfalls and your simple but highly effective methods leave a deep impact on people’s minds. What you are doing for others is highly commendable. My family joins me in wishing you all success in the new business project that you have started. Many many happy returns of the day! What a day to be born in and I know that you are a true Leo ! I am very honored to know you Sir. I pray God to give you all that you would wish for yourself. My humble Namaskaarams to you. Happy Birthday to you dear Tavamithram Ji!!!!!! Have a great day Tavamithram Ji and I will wait for my next turn to call you on Skype. after reading the pages of this blog, I feel truly enlightened. Thanks for your teachings and guidance. I would like to meet you some day in the near future. How does this happen, how to share the good thoughts with our kids who are very small to understand the spiritualism, I would appreciate if you write the details in this blog. You are such a privileged soul to receive a personal birthday message from Tavamithram Ji! My best wishes to you and to your family. I really hope that the lessons that I learnt from Ketu Dasha help me through my Venus dasha also. I just can not thank you enough! You have been my guardian angel. Its great to see you on Facebook! Also, your blog is one of the most credible astrology information site on the world wide web. I hope you keep up the good work so that many more like me, who need hope, can always come to you and seek guidance. May god bless you and your family forever….. When did you post it? I have been visiting your site regularly, but somehow today I went to the about page to see if there was something new in it and I read about you. I would like to invite you to Vancouver. It would be great of you come over and give a talk in our organization. I just now returned from a dinner meeting and I will call you on Skype this afternoon. Thanks I do understand and even believe that what is meant to be is meant to be but this damn heart sometimes don’t let our mind work peacefully 🙂 and I am trying my best to keep positive. Will get back to you soon! “A Journey of a thousand mile began with a single step” . This quotation is for you sir and all your guidance is helping me a lot to a change in me. I am sorry to hear about your father’s injury and I pray God for his fast recovery. My own family and our Tavamithram family are doing well 🙂 and the latter one is growing quite fast .. Please take good care of your Dad and do get in touch me once he is back home. I just read your reply have been out of picture for a while. With already so much happening in life :(…. my dad suffered a hip bone fracture he slipped at home and was hospitalized had to under go a surgery, by the grace of God he is recovering well now. No, we all have the freedom for speech so I don’t mind at all, what you wrote is a famous saying and true in sense BUT 🙂 it is easy to advise only the person suffering can feel the intensity of his/ her sufferings. Anyways you are but right 🙂 and I hope all is well with you and your family. My best wishes in everything… we will decide mutually for another chat session once my dad is discharged from hospital and am a bit free from some pressing issues currently. Thank you very much for your kind words sister. You are most welcome to join us in this mission of always being there for our brothers and sisters. It was a pleasure talking to you and you are a gem of a person to put it mildly:)). Its commendable that you are responding to all of us that too selflessly with no personal agenda. You have a way with words and make the not so good things look good too:)) Hats off to you and appreciate your time and effort. I would also like to acknowledge the role of your supporting family who are allowing you to devote time for this. So three cheers to your immediate family too. Once again, you are doing great work and am glad to be in touch with you. Yes, sure..let’s discuss again in the next week. Sorry, if you did not like what I said 😦 But this will certainly help you in feel lighter in your heart. Wish you good luck in everything, Sarah. thanks for your message. In order to reach the 100th floor of a building, we have to pass through all the floors. Life is just like that. The most important thing is to set a goal and to visualise what it would be like after achieving the goal. Total belief and sheer passion will automatically boost self-confidence and take us on the right path. The Sade sati is truly a great period to regularise one’s life. I would advise Dhanu rashi people to start preparing themselves for the start of their Sade sati at at the end of this year in order to avoid a rather jerky takeoff! I am delighted the way I was sent an very analytical and conceptual reply by tavamithram (I am mentioning this as symbol), on my issues due to planet positions. Every word is motivating and has given reason to believe that even all efforts needs support of luck and planets . I thank my brother once again and will get moral support. Please send us an email just before and I will log into our Skype account. Hello bro, me too waiting for us to talk on phone or skype as need your valuable guidance 🙂 though I understand you have a very busy schedule. Good day to you and your family Bro Parag and a great weekend too. Rgds. We are doing well Brother, thank you very very much! We are waiting to see you on Skype very soon 🙂 Why don’t you post your photo on this blog? We will be leaving for Niagara for the weekend. Will call you from there. Thanks bro :), it is lovely to know my Indian brothers and sisters through this platform and this is all because of you, am all praises for you. Yes I remember very well that we are! and for sure every little bit of an effort counts. You remember, in my first reply to you, I addressed you as my long lost ‘colonial cousin’ from across the border … Maybe we should do our tiny bit to take this beautiful message of friendship forward.. Please excuse me for this short message to you as I will be able to write more in detail only Friday evening. I am equally obliged by the loving message from Mr. Parag L.K and through this forum convey my equal feelings to my Indian Brothers n sisters we love them too. When I was in Dubai had many Indian friends and had a great time with all n still very much in touch. Countries have their own issues but people in general have deep feelings especially of India n Pakistan sharing the same history. As you no am a great admirer of your writings and your advising n counselling techniques and try to keep in touch as frequently possible. Now again Mars is entering Libra n is not comfortable their as both are poles apart please bro tell me how this is gonna impact my life and what precautions I can take not to suffer in relationships, litigation issues going through presently and business. Earlier you advised me that on the 26th of February 2014, Venus will move to Capricorn which is owned by Saturn. Saturn and Venus are friends and they will support each other. This celestial event will give people a great boost in matters of health, wealth, love, property matters, vehicles, jewelry, etc. How will you relate this retrograde with this occurrence of Venus in Capricorn and being friends to Saturn, it’s owner in case of my planetary positions? Will this help me according to my natal chart in overcoming and/or nullifying negative impacts of Mars in Libra starting March 1st to May 19th, 2014. What I have generally read about this placement when Mars gets retrograde in Libra n it is gonna last for fairly good period of approx 8 months … it causes rage, anger, outbursts. Mars is my ruling planet too, also my man is a Libra, how this will effect us? Me ruled by Mars n he, sun sign Libra am worried. And my blessings to Mr Parag L.K and his family in Vancouver. May God Bless you and your family my dear. Dear brother Tavamithram, I am amazed at the way you have understood my situation and my mind! Can you read minds??????? You are saying that you are not a Babaji or something then who are you? I am following exactly what ever you said and I feel a lot of strength in me. Even my wife and children are seeing the huge change in me and in our life. Your own story ‘Life is a gift-live it’ is very scary and touching and I thought how you came out of all that! Yes, let us accept the present as a present! And not be bothered by all what so many people say about sade saati! Please continue to guide me and my family. I found you on facebook. I sent you a friend request. I like your modern way of teaching true Indian values! We pray for the well being of you and your family. Thank you a million times Sirji! Our Pranaams to you from Vancouver! You are doing a great job keep it up. May you be rewarded for this good deed and helping fellow humans and giving them a listening ear without any greed or selfish motives which is a rare thing in present times.